The mitochondrion is a power plant and industrial park of the cell where energy stored in the bonds of carbohydrates is converted to a form more useful to the cell (ATP) and certain essential biochemical conversions of amino acids and fatty acids occur. Mitochondria is about 1 mm in diameter and 1-10 mm in length. 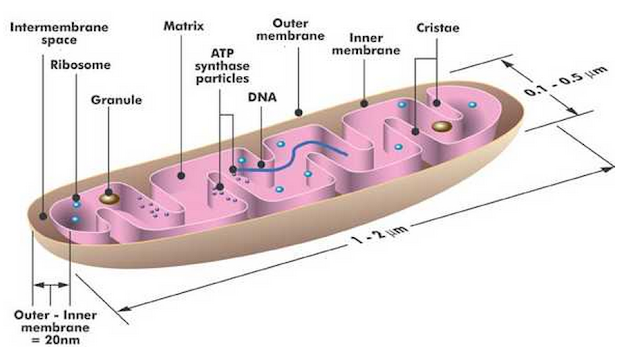 Mitochondria have dynamic structures that move, change their shape and divide. Inner membrane is convoluted and contains embedded enzymes that are involved in cellular respiration. The membrane' have many infoldings called cristae which increase the surface area available for these reactions to occur. 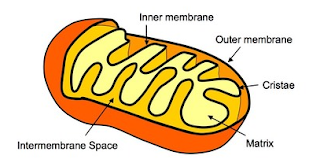 The inner and outer membranes of mitochondria divide it into two internal compartments: inntermembrane space is the narrow region between the inner and outer mitochondrial membranes. It resembles the solute composition of the cytosol,because the outer membrane is permeable to small solute molecules. Some respiratory enzymes are embedded in the inner membrane. The major function of the mitochondria is to produce energy. The energy giving food molecule are sent to the mitochondrion where they are further precessed to produce charged molecules that combine with oxygen and produce ATP molecules. This total process is known as oxidative phosphorylation. NADH and FADH2 from glycolysis, pyruvate oxidation, and the citric acid cycle are oxidized by the respiratory chain, regenerating NAD+ and FAD. Most of the enzymes and other electron carriers of the chain are part of the inner mitochondrial membrane. Oxygen (O2) is the final acceptor of electrons and protons, forming water (H2O). A Chemiosmotic Mechanism Produces ATP As electrons pass through the series of protein complexes in the respiratory chain, protons are pumped from the mitochondrial matrix into the intermembrane space.As the protons return to the matrix through ATP synthase, ATP is formed. What does "tt" refer to in the statement "tt resembles the solute composition...."???? Sorry, it should be "It resembles...". Thanks for the question.